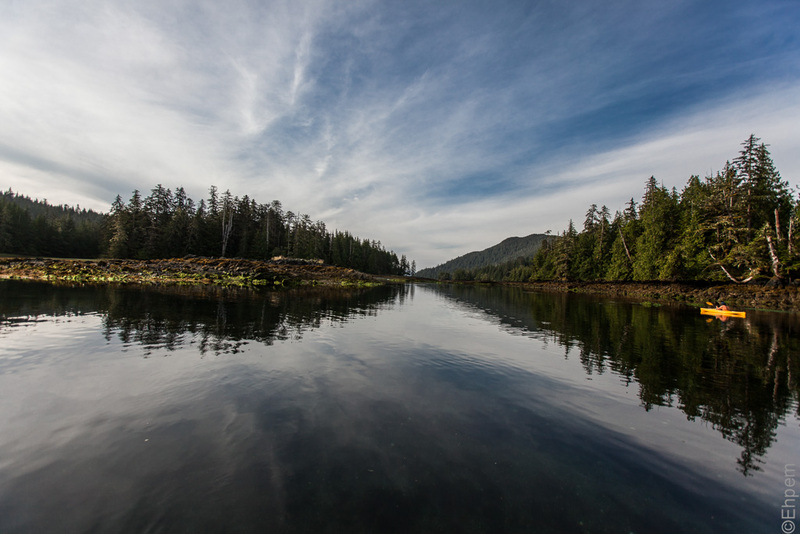 Another photo from my trip on the Passing Cloud, this time in what is called locally Burnaby Narrows (Dolomite Narrows on the chart), in Gwaii Haanas, Haida Gwaii. Once again there is some nasty compression artifacts that occur during WordPress uploading evident here. I am in the middle of discussions with a “happiness engineer” and perhaps in the next few days I will have some information to pass along about what can be done about this problem. I envy your work environment, Mr E! Hi Kate – I envy it too. I don’t get enough field time, but am fortunate to get it in some of the most beautiful places imaginable. Is your field time decided by a university? I imagine most of your time would be taken up with writing about your field research. Even if only a small time out, you are right about how fortunate you are to be in such lush and gorgeous places rather than dry and dusty deserts. Hi Kate. My field time is partly decided by a university as my major research project is with a university based group working in another part of the British Columbia coast. However, the rest of it is decided by the vagaries of contract work of various kinds. The trip these photos were taken on was not really field work, or at least not my usual kind. I was on board the Passing Cloud to share my local knowledge about Gwaii Haanas and Haida Gwaii with the passengers. Kind of like on-board naturalists who are commonly found on ecotours, except my knowledge is archaeological and also of good places to take people to see particular things both cultural and natural. I took this opportunity because it was a chance to get back to one of my favourite places, and to do it at a slow place more suited to observing surroundings than I am accustomed to during my normal work. Well worth the time, I hope to do it again! It sounds like my kind of tour. I hope you get to do it again, too. The photos are just wonderful and I am sure there would always be new things to document on subsequent trips. Were the people on the boat already well informed about archaeology/anthropology generally, or were they interested lay people? The people only knew there would be an on on board “expert”. I think OuterShores are trying to give more detailed info in advance of the expertise that will be available, but most of us that do this work for them are working professionals and can’t usually commit far enough in advance for their publicity needs. Must be a complete pain in the neck for them! Yes, but such a great way to get people involved and passionate about making sure the area is protected for the future. A great thing to be involved in. Thanks Kate! It is. Actually this is in the “Gwaii Haanas National Park Reserve, National Marine Conservation Area Reserve, and Haida Heritage Site” – it has a very long title, which essentially translates to mean that it is protected but neither the Federal Gov’t nor Haida Nation acknowledge each other’s sovereignty over the land, but agree to co-manage the land as a protected area. Part of the trip we do is outside of Gwaii Haanas, and is rather instructive of what Gwaii Haanas could have looked like had it not been protected as there are areas with very heavy logging just to the north.